Jake comes to VibraSÓN from a somewhat different background. Originally from the Midwest, Jake studied classical piano and music theory in college at Univ. of Illinois, taking up Jazz piano after graduate school at University of California, Berkeley and then became involved in Latin music and dance in the 1990s when he took a keen interest in Salsa dance. 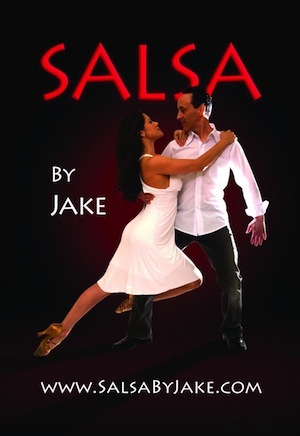 Jake has taught nightclub salsa dance lessons for over 20 years in the Bay Area and worldwide, and finally honing his skills in Latin music over 10 years ago with an addition of percussion. Jake studied with many of the Bay Area greats, including Karl Perazzo, Edgardo Cambon, Louie Romero, Carlos Caro, Michael Spiro and others, but teaching at the Bay Area's largest Salsa club for over 15 years gave him a unique opportunity to study the music first hand, and also sit in with over 20 bands while he was coming up the ranks. He played regularly with several salsa bands. Jake's dad was a working pianist for over 50 years, and his uncle was a famous xylophone player and Jake always had a taste for vibes-based salsa, conceiving of this band over 5 years ago. Luis has a long and diverse history in music, starting with one of the best Salsa bands on the West Coast - Avance! led by Santana Band percussionist and maestro Karl Perazzo. Luis has been a vocalist with many of the hottest Bay Area salsa bands. Luis now sings with Pop Fiction a very popular band here in California, Montuno Swing, and our very own VibraSÓN. Carlos Caro, originally from Cuba, has a long and distinguished career in music. He has played with many other great musicians as one of the best percussionists in the world. Carlos plays with a number of Salsa bands in the Bay Area, including his own band called Vission Latina. He also is a great instructor for aspiring musicians, and a 2014 GRAMMY® Award Winning percussionist. He has performed on tour with and has recorded for some of Cuba's biggest names in music including Paulo Fernandez Gallo and Jackeline Castellano's best selling "La Dama Del Son"Caro immigrated to Mexico City in 1993 where he was commissioned to record and perform a work in the Danzon style with the Mexico City Philharmonic. He then appeared on the West Coast music scene in 1996 to quickly become one of the most sought-after Latin percussionists, simultaneously playing in the best Cubano, Salsa, and Latin Rock bands throughout the San Francisco bay area. He has performed with Rebeca Mauleóón, Omar Sosa, QBA, Avance, Eddie Palmieri, Armando Perazza, Candela, Malo, Ritmo Y Armonia, Dr. Loco's Rocking Jalapeño Band in 2004. Carlos Caro released his first album with Vission Latina and the second one in April of 2010. Music from this CD was recently chosen for a movie soundtrack! Charlie is an accomplished pianist and has played with many of the Bay Area Salsa bands. 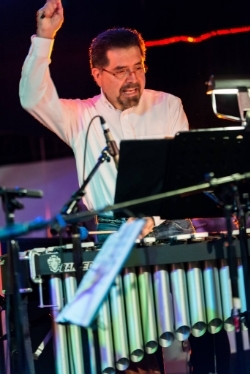 He also has a Latin Jazz band where he plays vibraphone, which made him a perfect choice for the repertoire of VibraSÓN! Arranger and Composer Charles Barreda is a man totally dedicated to his art. Charles "Carlos" Barreda" Keyboardist, Vibraphonist - Marimbist, Drummer - Percussionist. Freelancing with many bands in the San Francisco Bay Area and booking his own bands "CORCOVADO" and "THE MARIMBA CONNECTION", he is a well regarded musician, band leader and producer for music projects. Since moving to San Francisco - California in 1973, Charles has performed and recorded with many of the SF Bay Area well known musicians and groups. Among them: Jules Broussard, E.W. Weinwright (African Roots of Jazz), George Cables, Si Perkoff, Tony Menjivar (Malo, Angela Bofil), Leo Rosales (Malo), Chalo Eduardo (perc.Sergio Mendez), David Rokeach (drums - Ray Charles), Orestes Vilato (Fania All Stars, Ray Barreto, Santana), Louie Romero (Willie Colon), Abel Figueroa (trb.Sonora Poncena, Santana), Karl Perazzo (currently with Santana), Pete Escovedo, The Cal Tjader Rhythm Section: Mark Levine (piano), Rob Fisher (bass), Vince Lateano (drums),Willy T. Colon (congas). Tito Garcia y Orquesta Intenacional, Pepe y su Orquesta, Safari, Kimbombo, Orquesta Kache, Actualidad, Classax, Radcliff, Sky Blue Waters, Montenegro Jazz Trio among others. Charles musical career started at the early age of twelve in his native Peru; where he played, recorded and toured Peru and South America. His formal training began in San Francisco - California at the Music & Arts Institute of San Francisco, where he studied classical percussion with Jack Van Der Wyck. He obtained a Masters Degree in Percussion and taught at the institute until 1988 when it closed. In 1982 Charles was ready to study more Jazz theory and improvisation on the Vibraphone. He asked SF Bay Area Latin Jazz Vibraphone legend Cal Tjader for private lessons, but at the time Cal was busy touring. His album "La Onda Va Bien" had won the 1981 Grammy Latin Jazz category. Cal highly recommended vibraphonist - percussionist John Rae, who had played vibes for George Shearing, Mongo Santamaria etc.. and was the principal percussionist for the Broadway shows that came to San Francisco. Marco Diaz is a talented musician that started playing trumpet (and still does) and then became one of the Bay Area favorite pianists. Marco Diaz was born and raised in San Francisco and was introduced to the trumpet in the fourth grade at E.R. Taylor Elementary School. His formal training in both piano and trumpet began at the age of 14. He earned a scholarship from the Community Music Center in San Francisco, and began playing professionally at the age of 17 throughout the Bay Area with various Latin Jazz, Salsa, Reggae, and R&B bands. He continued his studies at San Francisco State University earning a Bachelors of Arts in Popular Music and a minor in Economics. Today, Marco is an accomplished recording musician who has shared the stage with Grammy Award winning artist, Israel “Cachao” Lopez, Jimmy Bosch, Pete “El Conde” Rodriguez, Ska Cubano (Europe), Tito Rojas, Nino Segarra, Anthony Cruz, Anthony Blea, Jovino Santos Neto, Joe Santiago, and is an integral member of the John Santos sextet, Bobi Cespedes group, and Doug Beavers’ Orquesta Rovida. Marco has participated in the San Francisco Symphony AIM program since 2000 and currently produces records and performs music throughout the country while also co-leading Vission Latina, an Afro-Caribbean dance band. Marco released his own CD entitled "Life Notes" and is currently in production with a 2nd CD to be released late 2015. Saùl has played with many of the Latin bands in the Bay Area and studied at the famous Berklee School of Music in Boston. Saùl has worked extensively in the Salsa and Latin music scene and offers great expertise and musical experience. Saúl Sierra Born and raised in Mexico City, where he started playing professionally in 1990. He moved to Boston Mass. in 1995 and attended the Berklee College of Music where he graduated in the summer of 1999, with a major in Performance. Some of his teachers included Oscar Stagnaro, Rich Appleman, Daniel Morris, and Jim Stinnet. He received the US Scholarship tour award and the Outstanding Performer award at Berklee. As a resident of the San Francisco Bay Area since the fall of 1999, Saúl has performed, toured or recorded with Nestor Torres, Jimmy Bosh, Eddie Montalvo, Johny Rodríguez, Orestes Vilató, Bobi Céspedes, Antonio Sánchez, Miles Peña, John Santos, Jesús Díaz, Rebeca Mauleón, Mark Levine, Greg Landau, Mike Spiro, Jackeline Rago, Chuchito Valdez, Alexander Livinali, Wayne Wallace, Aquiles Baez, Marco Granados, Anthony Blea, Doug Beavers, and María Márquez, among others. For the past 10 years Saúl has been a member of some of the leading bands in the Bay Area, including The John Santos Quintet/Sextet, Bobi Cespedes’ band, Dr. Loco’s Rocking Jalapeño Band, El Tren Trío, Anthony Blea y su Charanga, The Snake Trío, Jesús Díaz y su QBA, The Bay Area Afro-Cuban All Stars, The Venezuelan Music Project, Corazón Sur, and Sababa band. 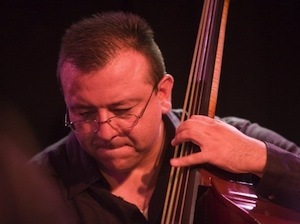 A founding member of Vission Latina, the band that he co-leads with Carlos Caro, percussionist extraordinaire, and Marco Díaz, virtuoso multi-instrumentalist (piano/trumpet ), Saúl keeps himself busy performing, composing, arranging and teaching in the world class musical community of the San Francisco Bay Area. A musical multi-lingual, GRAMMY® Award Winning percussionist, Christian Pepin, is a versatile musician embodying the soul of a percussionist that inherently stirs the human spirit. Young Christian Pepin shows perceptiveness and adoration for Latin music combined with experience beyond his years. His keen sense, gifted interpretation of music, and the influence of the New York streets allowed Christian to excel at his craft. From his humble roots in Rio Piedras, Puerto Rico, Christian Pepin has played music all his life. His father, a gifted musician in his own right, and mother, a talented vocalist, gave him a set of drums at the tender age of six. As he became older, he made the transition to timbale, then congas, and onto bongó all while perfecting his musical craft. Music is innately a dominant part of the Pepin family: his great-grandfather Toño Pepin, his Grandfather Papo Pepin, and his cousin Bobby Allende. Music breathes life into the soul of Christian Pepin that sustains him as a musician. Christian has performed and/or recorded with the likes of Poncho Sanchez, Tommy Igoe, Nestor Torres, Pete Escovedo, Steve Turre, Pacific Mambo Orchestra, and many other artists. -Symphonic: Has performed with the Pacific Lutheran University Symphony; Pacific Lutheran University Percussion Ensemble; Spokane Symphony; Seattle Symphony; Eastern Washington University Symphony. -Recordings: Pacific Mambo Orchestra; Fred Randolph; Michael O’Neill; Kenny Washington; Lary Barilleau; David Jackson & W.O.W; Pedro Rosales; Julio Bravo; Montuno Swing; Aaron Routtenburg; Santos Perdidos; Armando Cordoba, Latin Rhythm Boys among others. Edgardo Cambon was nicknamed “El Sonero Del Uruguay” by master Cuban pianist Jesús “Chucho” Valdes while singing with his group “Irakere” at the Habana Jazz Festival. Edgardo started his professional career at the early age of 9, singing Tangos on public TV, and playing traditional "Bombo Leguero" (a low pitch double headed drum, very popular throughout South America) as well as the Uruguayan Candombe drums. When he turned thirteen, he heard Santana's "Abraxas" album. "I got so excited that my father bought me a cheap bongo so I would stop “drumming” on the back of my Spanish guitar!" Cambon has performed and toured throughout South America, Europe and Africa and has resided in the USA since 1987. Although mainly self taught, he has also traveled to Cuba many times since 1989, where he studied at the ENA (National School of Arts) in Havana and privately with master drummers Jose Luis "Changuito" Quintana, Vizcano Guillot, Octavio Rodriguez and Justo Pelladito among others, and while in Cuba, he performed at the Havana Jazz and Benny Moré Festivals. Edgardo has performed and/or recorded with artists such as "Chucho" Valdes (Irakere), Carlos Santana, José Luis “Changuito” Quintana, Joan Baez, Claudia Gomez, Jerry Rivera, Eddie Santiago, Keith Terry (Crosspulse), “Los Muñequitos de Matanzas”, Omar Sosa, Mark Levine, Andy Narell, Sovosó (formerly Bobby Mc Ferrin's "Voicestra") Mike Spiro, Karl Perazzo, Rebeca Mauleón, Jackie Rago, Richard Olsen Big Band, Los Compas, Sol y Luna Band, Maraca, Eddie Montalvo, Giovanni Hildalgo, Johnny Rodriguez, Armando Perazza and many others. Edgardo also leads his own salsa band Candela and the a smaller quintet called LaTiDo. A San Francisco native, Sean grew up in the Mission / Bernal Heights section of the city. A lifelong salsero, Sean's interest in percussion started long before his Father gave him his first conga at the age of 12. In the late 60's and early 70's his family would often play the Fania All stars, Celia Cruz, Johnny Pacheco, Eddie Palmieri, Tito Puente, Ray Barretto, Joe Cuba, Cal Tjader, El Gran Combo, Willie Colon, and Hector LaVoe. Coming from a family with a history of musicians, which includes legendary jazz vibraphonist Bobby Hutcherson. Sean was not the first conguero in his family, his uncles, the late Richard Ramirez and Tony Zuniga, taught him his first chops. In the early years Sean studied great congueros such as Mongo Santamaria, Tata Guines, Ray Barretto, Carlos "Patato" Valdez, Johnny Rodriguez, Eddie Montalvo, Armando Peraza, Milton Cardona, and Francisco Aguabella to name a few. 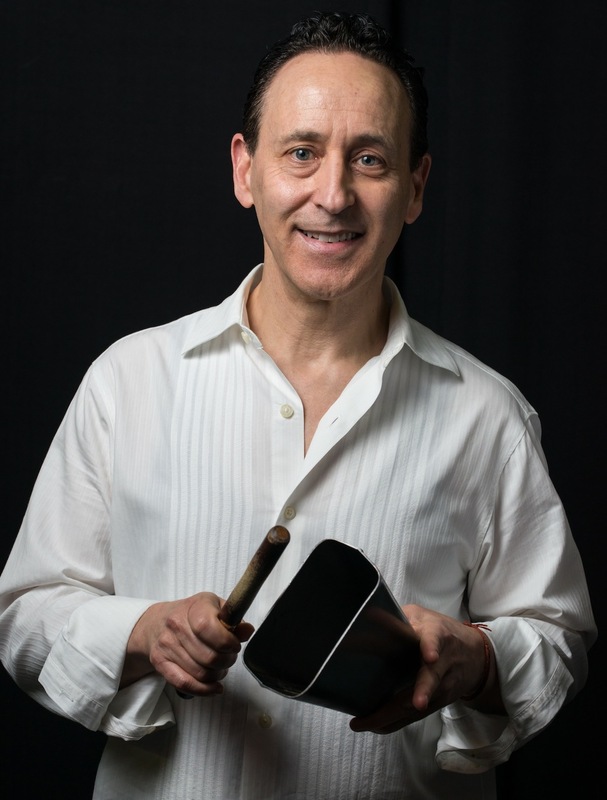 Sean has studied with legendary Bay Area percussionists Edgardo Cambon and John Santos. Sean got his first break at the age of 16 when he was invited to play with Leroy Rodrigues Y Los Isleños at the Puerto Rican Club in San Francisco. Sean has played with Maelo Ruiz, Lalo Rodriguez, Ray De La Paz, Ray Sepulveda, Van Lester, Mel Martinez, Hector Rey, Jimmy Bosch and Chino Nunez, as well as with many of the local salsa bands in the Bay Area. We thank all the great musicians that have contributed to VibraSON! For bookings, please contact Jake using the contact form on this site. You may also visit us on our Facebook page. VibraSON is a great choice for music for you event, dinner party, wedding (wedding band), salsa club, outdoor festival, etc. !